In German the name of the flower translates directly to "noble and white". Historically the blossom has been touted as a love charm, proof of bravery and even as medicine to heal wounds and ward off evil. 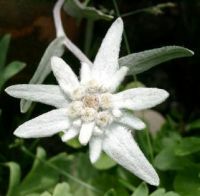 Edelweiss has long been the national flower Switzerland, and during WWI it was used as the symbol of the alpine troops in both Austria and Germany.